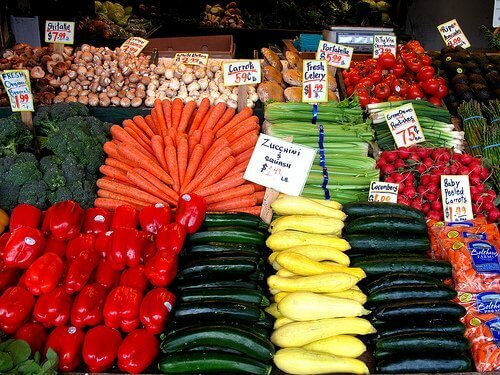 I grew up in West Michigan where the local farmer’s market was always a highlight of the summer. Early on Saturday mornings my sisters and I would head to the market with mom to buy yummy, fresh, and local produce, and THE BEST cinnamon rolls from a Mennonite family to eat on Sunday mornings before church! My mom was raised on a farm in Ohio, so she always taught us the value of fresh produce, whether we grew it ourselves in our garden, or we bought it at the farmer’s market. When I moved away from home I struggled to find places to buy fresh produce. And if I did find a market or local produce stand, I wasn’t sure the best way to go about finding the kind of food I was looking for. This past year, we moved to a new home on the other side of our town, and within walking distance to the farmer’s market! I was so excited to be able to frequent the market and buy fresh and local produce, just like my mom did when I was growing up. But, the farmer’s market here is much different than the one that I grew up going to. Ours is indoor, and open year round, and has everything from a restaurant, antiques, hand made items, fresh coffee and even meat counters, and more, as well as local produce and plants. I was a little overwhelmed the first time that I walked through. Which vendors are the best to buy from? Why is there a booth with cheap sunglasses at the farmer’s market? Why does that produce stand have bananas? How do I know where and how these tomatoes, or corn, or apples, are grown? And then my mom came to visit one weekend and I took her to the market with me and watched and listened and learned, all over again. I still feel fairly new to being a productive shopper at the farmer’s market. But I’m learning that one of the most important ways to get the most out of the market and all it has to offer is to ask questions, lots of questions. The first thing I learned is to ask open-ended questions. Instead of yes or no questions like – Do you use pesticides? Or, Is your beef grass-fed? How about – How do you grow your strawberries (or corn, or tomatoes)? Or, How do you raise your beef (or chicken, or lamb)? Let the farmer tell you about what he does, most of them are more than happy to tell you all about what they do. And you may find that diamond in the rough – the produce booth that’s not certified organic, but uses all organic practices to grow their fruits and veggies, or the chicken that is supplemented with corn and grain, but is also free range and pastured, and raised without antibiotics, and is half the price of certified organic pastured chicken. Also, if you are trying a fruit for vegetable for the first time, ask about the best ways to store, prepare, or even preserve it. Farmer’s have a wealth of knowledge about the products they sell. The day my mom and I were at the market she bought leeks for the first time and asked the women at the booth what to do with them. She probably learned more than she ever needed to know about leeks that day! Also, there are specific questions that are really helpful to ask. Questions like, When was this fruit or vegetable picked? If it’s been more than a day, you might want to pass, you can probably find some that were actually picked that same morning. Also, you might want to ask where the produce is grown and raised. Part of the idea of going to a farmer’s market is to buy locally, but when you see something that seems like it’s probably not locally in season, like bananas, you can ask where it’s from. A tip that my mom taught me is that if the produce has grocery stickers on it, it was not grown by the vendor that is selling it. 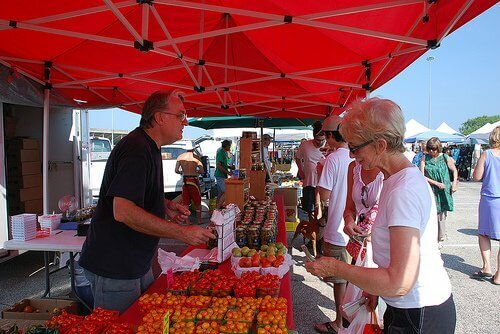 One of the vendors at our market brings in produce from Florida, like strawberries and tomatoes. While it would be really nice to buy strawberries right now, I know that our strawberry season is right around the corner and I’ll be able to get local, fresh, amazing strawberries at a great price. I’ll pass on the ones that were shipped from across the country. And don’t be afraid to ask for a deal! If you’re buying a large amount of something to preserve, ask for a lower price. A friend of mine recently got 25 lbs. of asparagus for $.75 less per pound than the regular price, and it was lower than the sale price at the grocery store. Most of all, don’t be intimidated to ask questions. Vendors are selling at the local farmer’s market because they want to sell directly to customers. They want to build relationships and share their expertise and knowledge with their customers. Sometimes I feel like a vendor or farmer might be bothered by, or not have time for, my questions. But remember, you are the reason the farmers are there, they want you to buy their products and be happy with them and keep coming back. 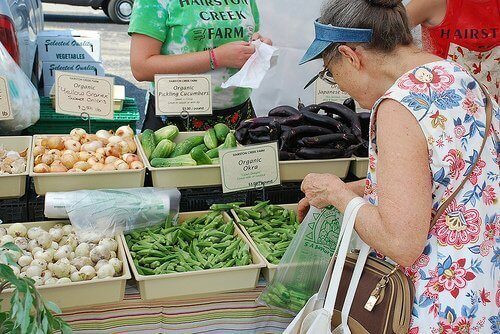 Take advantage of the opportunity the farmer’s market provides to learn all you can about where your food comes from, how it is grown and raised and processed. What questions do you ask the farmers at your local market? Ask me anything, anything at all! One thing I learned last year was that most of the sellers at the local markets in this area purchase their produce at an auction then sell it at the market under the pretense of it being their own produce. I was so disappointed when I found this out. For me asking if they grew the produce and when it was picked has been a big lesson learned. Thanks – this was so helpful! .-= Jessica @ This Blessed Life´s last blog ..Parmesan Broccoli – Just Say No to Velveeta! =-. I’m from the Grand Rapids, MI area, and LOVE the Fulton Street Farmers Market! Grand Rapids is also seriously considering having an indoor market, somewhere downtown. Plans are currently in the works, but it won’t happen for at least a year or two. But sunglasses? I guess it would be OK, IF, and that’s a mighty big IF, they were grown locally. My farmer’s market is VERY small (like 10 stands on a good day, sometimes as many as 3 or 4). I also lived in a city with a huge (over 400) stands and it was much like you describe- bananas, lemons, crafts, cheap clothes, etc. So wierd! I’ve heard of some markets that are local/organic only…what a dream! I also have learned that at least at my market, if you see it, buy it while you can. Its often not there again. I’ve seen local, unsprayed grapes, apples and such…but only for one week, as its just some surplus they had in their own garden and then its gone. We just moved to this area and haven’t checked out the local farmer’s market yet. I hope to do that this weekend and appreciate your tips! .-= Greta @ Mom Living Healthy´s last blog ..Starting the Day off Right =-. I work as a farmhand and market vendor at a local organic farm. I love to answer questions and give out my best recipes as well. One trick for telling if the corn is just picked fresh, is to pierce a kernel with your thumbnail, if the juice runs clear the corn is super fresh. Tomorrow we’re going to harvest the first of this seasons strawberries. Can’t hardly wait. .-= Mary @ Turkey Farm Treasures´s last blog ..Hollister, Abercrombie and Fitch equal Prom Money =-. .-= Carra´s last blog .."Real Simple" …real dangerous =-. Excellent article! I am going to visit local farmer’s markets this summer with a lot more confidence armed with your helpful tips. Thank you. .-= Susan´s last blog ..Humbled and Blessed by My Daughters =-. I’m lucky to have found a couple great farmers to work with, one that follows organic practices but isn’t certified. I can sometimes get ground beef from him for $3/lb and I know it’s grass-fed and chemical-free! Pretty awesome. Our local farmer’s markets are awesome too…the summer, outdoor ones. We have an indoor one but I’ve frankly not been satisfied with their products so I typically don’t go. .-= Kate´s last blog ..Do Your Research! : Antibiotics =-. I have Celiac and have found the need to ask what the farmers are using for cover crops especially on or under their berries. Hard veggies with thick skin are easy to scrub but strawberries can’t really be scrubbed to wash off any straw/oat contamination. I have been able to find local farmers who grow their strawberries on plastic which means I get to eat them! Just another part of learning to live with Celiac. .-= Michelle´s last blog ..Kasha Meatloaf from Body Ecology Book =-. I live in Florida and support local farmers when we can’t grow enough of our own produce. We have one farmers market in this area and I was disappointed to learn that most of the “farmers” sell produce they bought in Georgia. When I asked one man how he grew his tomatoes so big and pretty, he gave a smirk, paused before answering and said, “It’s not easy.” I knew right then they weren’t his. Being farmers ourselves, I know farmers are usually more than happy to talk about their bountiful beauties. I left the market empty handed and drove to a u-pick farm where the prices and people were much friendlier. Thanks for your wonderful tips. If you really cared for the small organic shopper you would never consider suggesting compromise on price. They work very hard for their small share and if you really support the farmer you would never ask for a discount.